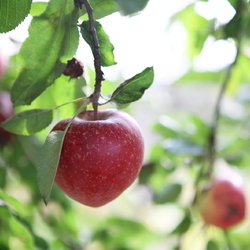 One taste of a crisp, tree-ripened apple can make you dream of planting an orchard of your own someday. A home orchard doesn't need as much space as you might think, but it does require some planning, especially if your space is limited. Many fruit trees need another variety for cross-pollination. Even self-fruitful varieties will bear bigger crops with another tree nearby. Proper spacing helps with pollination as well as with fitting in more trees. You may be surprised at the fruit-producing potential of your small yard! I started planning our garden layout here as soon as we put down a deposit on our suburban plot. We knew we wanted fruit trees and other garden areas, and my husband wanted to be sure the yard still included a certain amount of grassy lawn for playing catch and badminton. Although we'd moved further out in order to have a bit more yard, we still didn't have that much space. I knew trying to fit everything in would take careful planning. Fortunately, most of our yard was very sunny, so I had my pick of locations for fruit trees. I decided to put them together at one end of the yard, both so they'd be close together for pollination and to make cleanup easier. Fruit trees come in different sizes, depending on the rootstock used in grafting them. While standard trees can get to 20 feet in diameter, semi-dwarf fruit trees can be planted on 12 to 15 foot centers, and dwarf fruit trees need only 10 feet of space. I got out my graph paper and discovered that if I staggered the rows, I could get those 10 foot centers with only 9 feet between rows. That meant I could fit a dozen dwarf trees (three rows of four) in a 27 by 40 foot strip along one edge of the yard. I did have to readjust my spacing to accommodate two semi-dwarf cherry trees and to fit a crooked willow in one corner. I then added a 6 foot wide strip in front of the orchard area to serve as a vegetable garden. I marked off the vegetable garden and orchard area, and we had compost tilled in to amend the clay soil before planting. With my little home orchard area mapped out and prepared, it was time to choose my trees. My husband had to have sour (pie) cherries, I had to have plums and apricots, and we both wanted apples. When I started paging through the Stark Brother's catalog, I noticed notes at the end of many descriptions about pollination: "Pollinated by X and Y. Good pollinizer for Z." I knew that apples needed cross-pollination, but I hadn't stopped to realize every apple couldn't pollinate all other apples. Bloom time is one consideration. Apples can't cross-pollinate if they don't bloom at the same time. Some early bloomers don't still have pollen available by the time later varieties start blooming. A few apple varieties are sterile and don't produce any pollen. They still need another variety for pollination, but they are of no use as pollinators. You may find some varieties described as "self-fruitful," meaning they don't require a pollinizer in order to produce fruit; however, cross-pollination will still enable these varieties to produce heavier crops. Fortunately, many extension services have put together pollination charts. 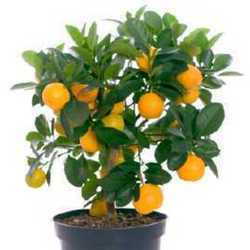 A good nursery can also help you check to be sure the trees you buy will produce fruit together. Do you need to plant a pollinizer if your neighbor has an apple tree? That depends on the distance between their tree and yours. Spacing of 50 feet or less is generally recommended for good pollination of dwarf trees, 20 feet for semi-dwarfs. Crabapples are decorative landscape trees with long blooming seasons, and they make excellent pollinizer for the apple trees in your orchard. If your space is limited, you might also consider espalier methods of training trees or planting one of the novel columnar apple cultivars. What if you really only have space for one apple tree? I've read suggestions about hanging freshly cut apple blossoms from a pollinating variety in your tree when it blooms, but that doesn't strike me as very practical. 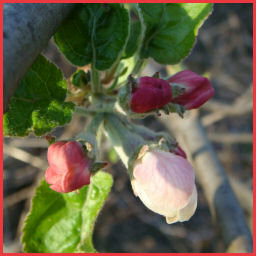 A better idea might be grafting branches from one apple tree onto another for pollination. Or you could consider an intensive planting method of putting two different apple trees into one planting hole. 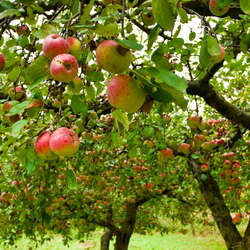 Some nurseries offer trees with several apple varieties grafted onto the same tree, offering both a selection of apples and good pollination. Narrowing my list of apple varieties down to the four favorites we had space for, and trying to make sure they met one another's pollination requirements, was like trying to solve one of those frustrating logic puzzles about packing jam or sorting crayons. If you've only ever tasted the few varieties available in supermarkets, you might want to search out farmer's markets, local orchards, or apple festivals to help you decide which varieties you'd most like to grow. If you've only got space for a few trees, you want to be sure you're growing your favorites. Some varieties may be better suited to your particular area. Your local extension service can advise you about varieties and chilling hours for your area. If you've always wanted a home orchard, don't dismiss the idea because your yard isn't measured in acres. Go through catalogues and PlantFiles descriptions, and make lists of varieties that sound good to you. Measure the sunny area you have available for your trees, and then use graph paper or a graphics program to work out how many trees you'll be able to plant there. Narrow down your choices according to pollination requirements and local recommendations. Good planning and preparation will get you off to a great start, and before you know it you'll be picking the best apple you ever tasted, from your very own tree! For basic information on planting trees, see my DG article,"How to plant a tree." The University of Missouri Extension Service has a good page on fruit tree pollination. Searching the web will turn up similar pages if their chart doesn't include the varieties that interest you. 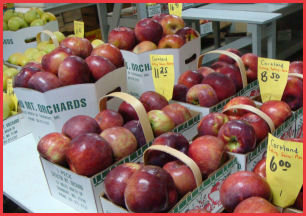 October is "Apple Month," and this is "Apple Week" at Dave's Garden. Every day, you'll find an article on a different aspect of growing or cooking with apples! For additional reading, see these previously published DG articles.